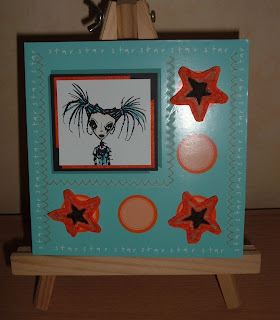 Stampoutique Design Challenge 23 is Orange & Turquoise. Now I only have 2 Stampoutique originals stamps at the moment and not a lot of Orange (although now I'm living in Holland I need more orange as it is kind of the national colour)and as I was searching through my stash it seems like I don't have a lot of Turquoise either hehehe so this was going to be a challenge. Then I found an old box of pre-printed cards which I have had for I don't know how many years and low and behold there was one which was Orange & Turquoise (it just goes to show that you should never, never throw anything away hehehe). So here is my offering for this challenge, I hope you like it. You did a great job on this, lover the layout. Thanks for joining us at Stampotique Designer's Challenge. Beautiful and funny lay-out! Thanks for joining us at Stampotique Designers Challenge # 23. Love the way you have altered the card! Thanks for joining us at Stampotique.